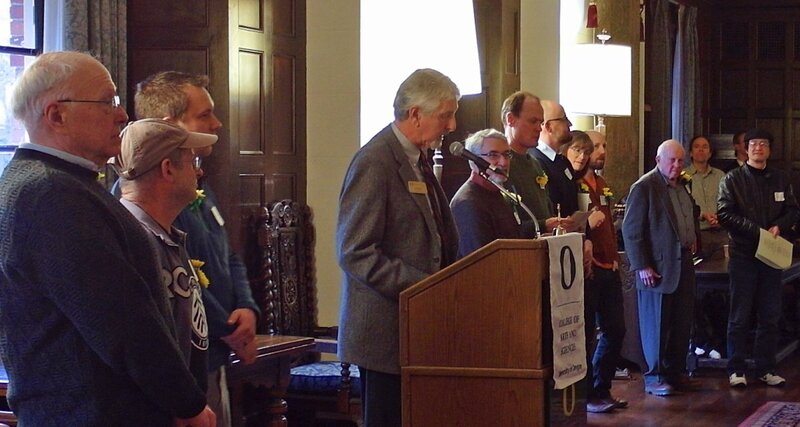 Sixty-two faculty members who received a total of 53 research, teaching or mentorship awards were honored by Dean Scott Coltrane of the UO's College of Arts and Sciences at this year's annual reception to celebrate faculty awards. Six faculty members received multiple awards. Eric Selker, professor biology, was elected to the National Academy of Sciences – one of only 84 new members elected this year. "Members are elected to the Academy in recognition of their distinguished and continuing achievements in original research," said Coltrane, adding that this is "one of the highest honors a scientist can receive." The Atlas of Yellowstone was recognized for Excellence in Physical Sciences and Mathematics from the American Publishers Association's PROSE (Professional and Scholarly Excellence) Awards. The Atlas project was led at the UO by Andrew Marcus, associate dean of social sciences and professor of geography, and James Meacham, a senior research associate and director and co-founder of the university’s InfoGraphics Lab. Alethea Steingisser of the InfoGraphics Lab managed the book’s production. Coltrane noted that Marcus also received another honor this past year, when he was named as a fellow of the American Geological Society of America. Peter Von Hippel, professor chemistry, was presented the Biophysical Society’s Founders Award at its annual meeting in Philadelphia earlier this month. The award is given annually to recognize outstanding achievement in any area of biophysics.